I’m so happy to see Moda get involved with this great cause. I’m a vet and a quilter. Thank you. I’m delighted to take part in this! This is a wonderful idea. Count me in! I’m definitely in, and will pass along the word to co-sewers and other quilters. Thanks for the opportunity to participate! WOOHOO, I introduced this to the guild when you visited and there was LOTS of interest. Sure hope LOTS of blocks show up in the next couple of months. AWESOME idea!! This is wonderful! I already made a block, but I missed in the instructions to leave it untrimmed. Does that mean not squared or with all the triangle tails and everything still on it? Mine is trimmed, I’m afraid, and is just over 10inches square. I’m in! My son is on Iraq and took the quilt I made for his Christmas present two years ago with him. When he needs a hug, he wraps himself up in it. (I embroidered a hidden “This quilt is full of hugs.” message in the quilt.) He’s shared that quilt with many of his friends while they have been overseas. I know the power of a quilt made with love. I’ll be mailing my block today! I am thankful for what you are doing. My husband is a veteran from an era when they were not honored and so I truly appreciate what you are doing for our military. My blocks are coming soon and my quilt groups too! Please remember no gold or yellow stars. Those represent our fallen and should not be on a quilt for a wounded service member. I will be making a star will mail it soon. I made fabric postcards for our service men and women for Easter last year. My block is done and addressed and will be on its way tomorrow. I’m also submitting your link to our guild newsletter. Wonderful project – thanks for getting us all involved. Great idea! I was wondering if there will be something similar for Quilts of Valour Canada – we have many vets/soldiers etc up here, too. I have passed this on to a forum and several Yahoo groups I am on. My thanks go out to all our Canadian and American troops for their service and sacrifice. Washed fabrics? Unwashed?? I am a pre-washer, and I just had a friend ask me about this – could someone please let us know??? Many thanks in advance! Hi. I understand to leave the blocks untrimmed, but I was wondering about how big the untrimmed block should be? I want to know what I’m aiming for! Thanks! Wonderful idea! I have committed to making a star for the loved ones who serve for our freedom. I have copied this info and a link to you blog on my blog. My son is a new Marine and today is his 22nd birthday, and his first away from home. I made two blocks today in his honor and they will be in the mail tomorrow. Thanks for coordinating such a great project! Semper Fi! I made 5 blocks this afternoon, and will make more this Friday, along with another DQF that will make some also. My LQS is accepting them, and her Moda rep will pick them up. Thank you Moda for doing this for our service men and women! I’d also like to know what the finished size should be so I know if I’m close! Also, where do you get a brown sigma pen? Can a different marker be used? Minick & Simpson (the designers of the featured quilt) have an instructional entry on their blog, here which should answer most of the questions in the comments. I’m in the same boat as omax2… are these supposed to be pre-washed? This is the first time I’ve been involved in a project like this. Thanks for inviting us to be a part of something bigger. I’ve made 2 stars and am ready to sign but don’t have a brown pigma pen. I hope black is okay. It’s a narrow pen. My husband just retired and his last command was of the WTB at Ft. Campbell (Warrior Transition Battalion). He said it’s been his mos rewarding assignment to be able to work wtiht he wounded warriors to help them heal and transition to a new assignment whether in civilian or military world. As a matter of fact, his retirement feels a little like a void so I’m glad to do this and many more projects in the next year! I tried to go to the link for the pattern and it took me to the YouTube picture of David Letterman. Where can I find the pattern? I made 3 blocks and mailed them yesterday. 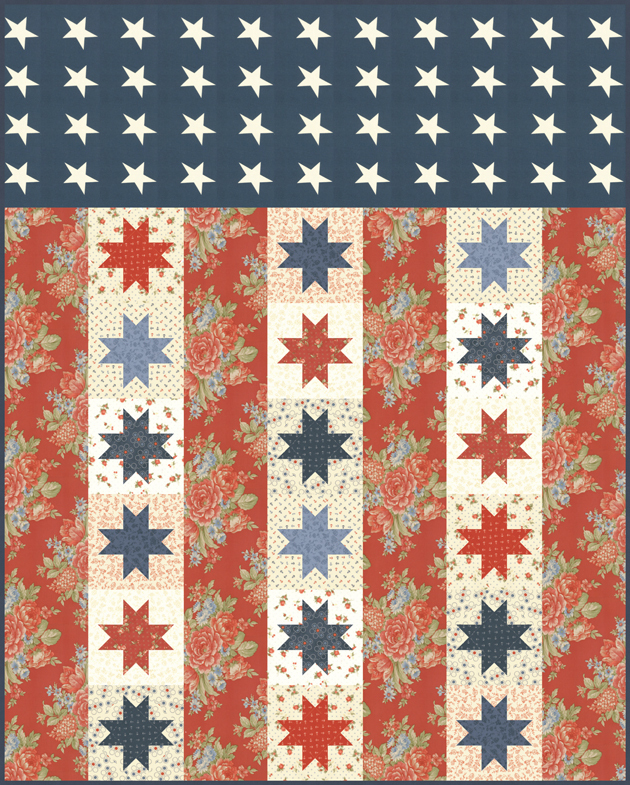 Thanks for organizeing such a great project where quilters can show their support for our troops. I may try to get a few more together before the deadline. Thanks Moda!!! I sure had fun making these blocks and sent off 8 of them a couple of weeks ago. It’s an honor to be part of this project! The Semper Fi Fund is a great organization. I just came across this project and presented it to the Thumbstall Quilt Guild Board in Central New York last week. I am happy to say that the guild is excited about participating in the project and will be sending our blocks to you next week. Thank you for initiating the project. Please keep us informed of future projects where we can show some support to our troops. Should the blocks be signed on the back or the front? This star block project was anounced 2 weeks ago at our Stafford Piecemakers Quilt Guild meeting in Stafford, VA. 2 of us work in the same office and we have mentored almost everyone, mostly non-sewers into making a block. Several have made 2-3 and one has made 6. One is even a gentleman. We will be sending our blocks as soon as we can. There will be at least 30 to send. Bright Hopes Quilting has collected (and will continue to collect through next week if you want to drop yours off!) over 40 stars now and the pile is still growing. We are all so pleased to take part in this project of yours. I was so happy to hear about this project! Supporting our troops is something that means alot to me. My son is in the Army and I have adopted his Company and made and sent many care packages and also provided little thank you gifts for the soldiers family members. So, when I heard about “Just One Star” I got busy and my package was mailed last week. My “One Star” turned into 50! God Bless all who serve! Thank you Moda for sponsoring such a worthy cause. Hoping we get to see a followup to all the stars. How many were received; pics of finished quilts etc. What a great company to do this. I have made 7 blocks for the project – 6 to honor each of my three grandsons who are in the military. They are brothers and the oldest and youngest are in the Air Force and the middle boy is in the Army. The 7th is for the oldest boy’s 7 year old son. I could have sent them 3 weeks ago, but I haven’t been able to get a brown pigma pen to sign them. We live in Western New York but are on vacation now in Texas near Houston but have still not found a shop that carries any Pigma pens. Would it be all right if I send the blocks unsigned and have someone “sign” them for me? Aww I just got a package of small quilt squares for my tiny contribution. That makes me feel good and bad. Good that I could be a part and I love the squares and bad that I didn’t do more and I feel so unworthy to receive these when others are giving or have given so much for me and my freedom. My family is a Marine family with my grandson currently serving. I am extremely happy to send my star blocks. We need to thank all of our military personnel for the great job they do. 48 blocks going in the mail tomorrow! Brown pigma pens are available at Joann’s, Michael’s etc. Made and signed my block. Will put it in the mail today. Loved this project. It pulled at my heartstrings. I have a daughter and son-in-law serving in the army. They are stationed in NC at Fort Bragg. They have had many friends come home wounded and seen the pain it causes both the soldier and his family. Wondering if something is being done for the other branches of the military? I’m on QB and see that some people have gotten knowleadgement that you received there blocks and being used, I have sent mine in over a month ago and was wondering were they not used? or used? Thank you Beth for letting me know where to find a pen. Since we are at my daughter’s in Texas, I won’t dare try to find a Joann’s or Michaels myself. I HATE THIS TRAFFIC. We were going to stop in Michaels Friday, but she forgot and I wasn’t going to remind her. She was so wound up trying to get ready for Easter Dinner. They are barbecuing chicken for over 40 people. I haven’t ventured out to meet the early crowd yet, but I already sounds like CHAOS. Will probably get a pen tomorrow, sign them in the car and send them right out. I thought Michaels would have them. I know Joann’s do, but haven’t seen one in our wanderings. Have seen 2 Michaels this week. Wonderful Idea! Count my sister and I in, we wil be sending our blocks on 4/27/2011. Wondering will you be posting a pic of quilts that were made? Thanks for the acknowledgement and the gift. I love the fact that I was a part of this great cause. Thanks to my favorite fabric company. Mine was just put in the mail!!! I was so excited to see a project like this! God Bless! I made 6 blocks – 3 red/3 blue stars. They were put in the mail yesterday – Priority Mail, should be delivered by tomorrow/Thursday. Thanks for the opportunity to touch the lives of those who have given so much. Will look forward to seeing the completed quilts! Loved this project! My brother-in-law was in the Army and died in the line of duty in Afganastan in March 2010. So, I made a block in his memory and one for my husband’s grandfather who served in WWII. I loved making the blocks. They were some of my very first quilt blocks. I sent my blocks in a month ago and never expected to receive anything…and havn’t. However, I saw today that others have received acknowledgements. Does everyone get an acknolegement? Are some not being used? Also, like another commenter, I was wondering if there are going to be pictures posted some where of the finished quilts? I’d love to see what was put together. Hi–My quilting circle, “Crafty Quilters,” got really excited about this project. We ended up with 13 blocks. The package was mailed on April 23, 2011. So far, we have heard nothing back. Are we supposed to get an acknowledgement that the blocks were received? The ladies and I have been wondering what is happening with the blocks. We’d love to see how all these blocks have been put together. The return address for our package is: Crafty Quilters, June Gladney, in Sacramento, CA. I would love to see photos of some of the finished quilts. My friends and I submitted several blocks…but I suspect Moda received many more than planned for so perhaps they are still working on the assembly. Is Moda still collecting blocks for this Just One Star Project? At some point, the directions say to trim the main star block to 8 1/2″ by 8 1/2″ inches. This cuts off the star points that you’ve been working hard to make perfectly. Cut these blocks to 9″ or even somewhat bigger; you might need to modify a few other directions slightly.